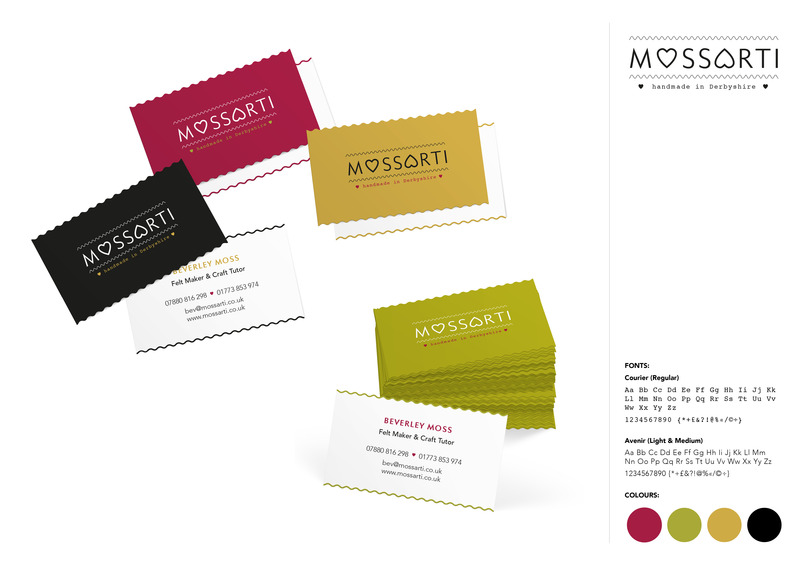 Mossarti is a slightly unusual business name, but one that my client Beverley Moss and I spent a lot of time discussing and debating. What we hope it captures is the spirit of fun and energy that she invests into every one of her handcrafted felt creations – as well as including a more obvious connection to her name, of course. These crafting skills alongside the love and enthusiasm that Beverley invests into each piece were also the starting point for my idea generation, where I have referenced a variety of textile stitching and fabric effects. The symbolic love heart shape is also everywhere in the space where Beverley works, so after compiling research and mood boards, they kept appearing in many of my initial sketches too! 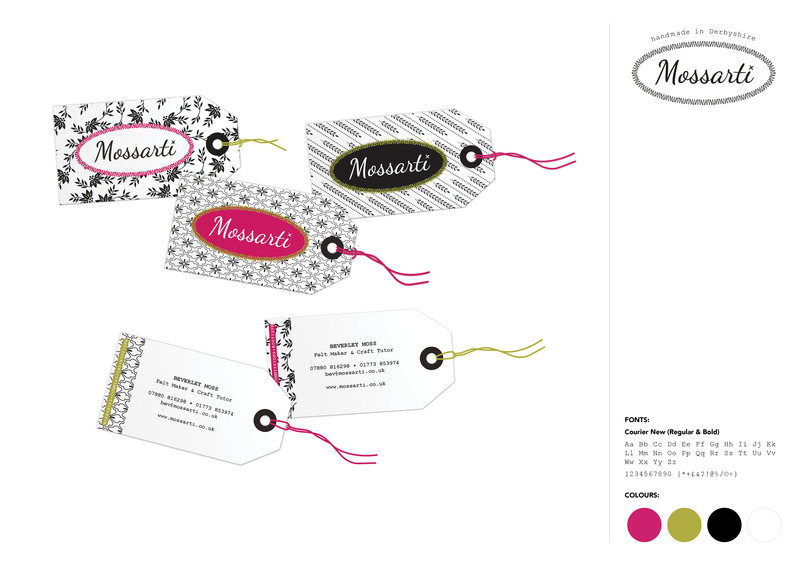 The colour palettes chosen are also designed to reflect her energetic personality. This project is a work in progress, so watch this space for future updates. I should cocoa in Belper is a wonderful place to visit for the most delicious and indulgent hot chocolate and other treats to eat and drink-in or to select artisan chocolates and other gifts to take-away. Run by husband and wife team, Sid and Lisa are as passionate about chocolate as they are about quality and customer service. 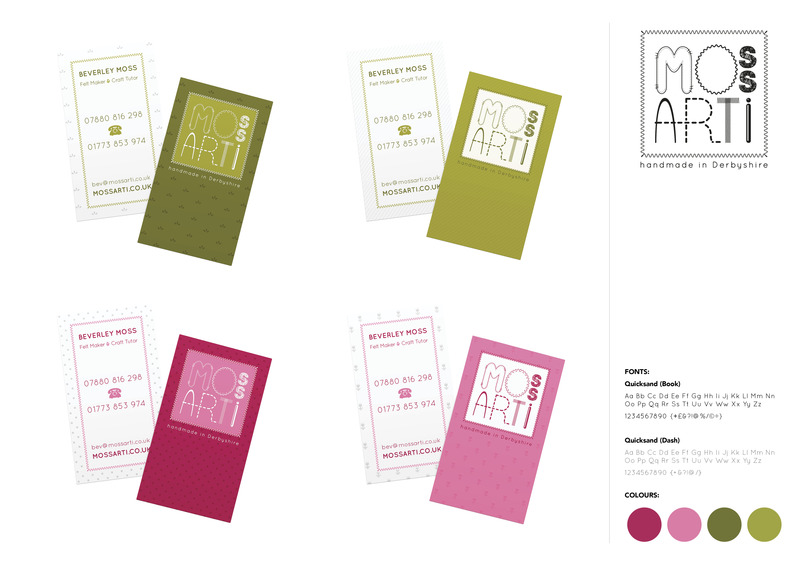 Back in September 2012, what began as a small brief to design customer loyalty cards, soon evolved into the requirements to design a whole suite of items for this small, but perfectly formed business. 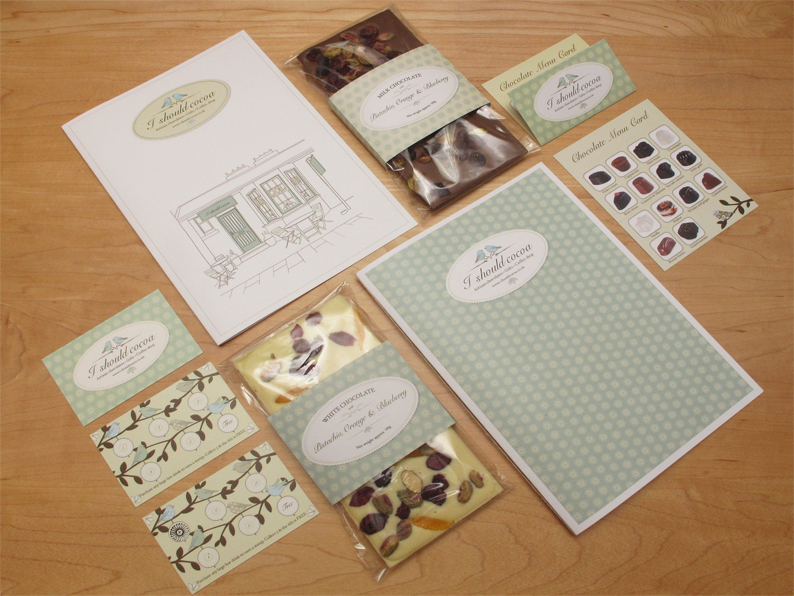 The asset list has now grown to include chocolate menu cards, table menus and simple solutions for two of their biggest sellers – hot chocolate flakes and 100-gram artisan bars in white, milk and dark chocolate. 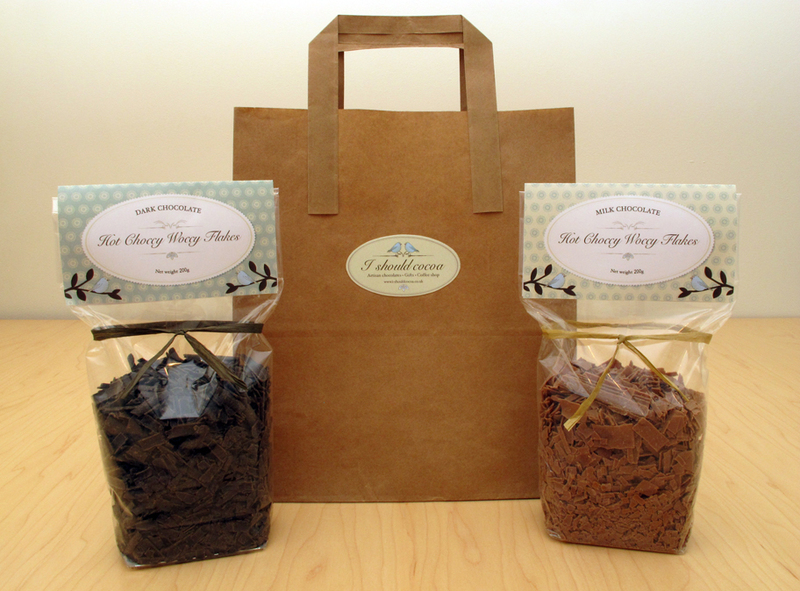 Each edible item is lovingly made and then packaged by Sid and Lisa, so I needed to ensure my packaging design solutions were elegant and sophisticated, but also cost-effective and relatively easy to fulfill. It’s been a pleasure to evolve I should cocoa’s visual identity and I look forward to creating many more assets in future – oh, and of course, enjoying their chocolate. 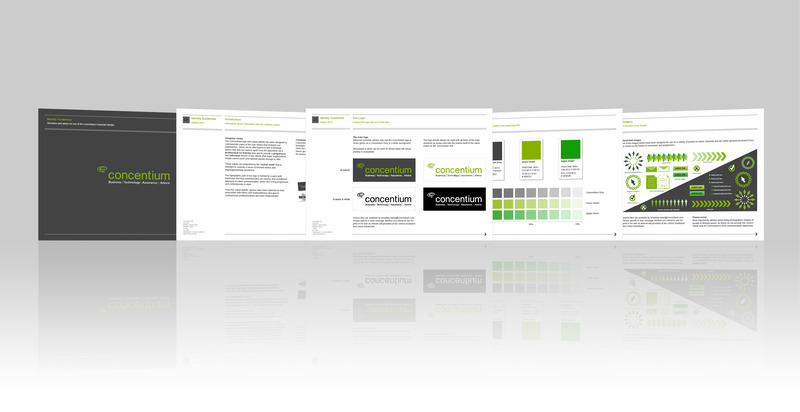 One of the most time-intensive, but ultimately rewarding elements of design consultancy is compiling and writing corporate identity guidelines. Its logo, fonts and colour palette (amongst other things) define the skeleton of any company’s corporate identity but the real heart of it all comes together to form the brand and to ultimately visually communicate how any professional organisation wishes to be perceived by its customers, clients and suppliers – to hopefully build trust and positive ongoing relationships, as well as knowledge, ownership and expectation of service levels. Concentium is a small ‘boutique’ technical and financial advisory service that has big plans for the future. They aim to provide a rapid, progressive and individually tailored service to their clients in a highly competitive marketplace frequented by larger and better-known organisations and this business objective is embodied by all of the elements that make up their corporate identity. By creating their Corporate Identity guidelines, my role has been to ensure that this message is consistently and professionally communicated both internally and externally. Equipped with just two Photoshop logo files and one printed business card I put my best ‘semiotic deconstruction hat’ on (thanks Edward de Bono for the metaphor) and set about defining all of the basic guideline information required. There is no doubting that Photoshop is a fantastically useful and powerful application, but it really isn’t designed for logo creation and manipulation, so I started by redrawing all of the main elements so that they could be edited for scale, resolution and colour. A primary and supporting colour palette broken down by Pantone, RGB, CMYK and hexadecimal reference, as well as fonts, a library of illustrative style imagery and definition of overall tone of voice soon followed. A technical development team are currently building a fully content manageable website, so the guidelines and related visual assets I created are now helping to form the basis of the site’s look and feel, which this is scheduled for release in the next couple of months. Watch this space for updates! It wouldn’t be an exaggeration to describe Fresh Basil Deli & Eaterie as a modern Belper icon and one of the best delis in the UK. In fact, Fresh Basil is listed by The Independent as one of the UK’s Top 50 Delicatessens and described as “the antithesis of some of the more chi-chi delis”, so when the owner manager, asked me to design some ideas for their Gift Vouchers I jumped at the chance to work with Wendy and the rest of the team – the promise of delicious coffee, cake and cheese amongst many other edible delights was also an undeniable incentive! The Deli and Eaterie is a classic mix of the best of traditional, authentic British retailing wrapped up in a homely and welcoming atmosphere. With their unswerving focus on providing quality produce and supporting local small businesses and makers, this was the same approach that I applied to my design thinking. 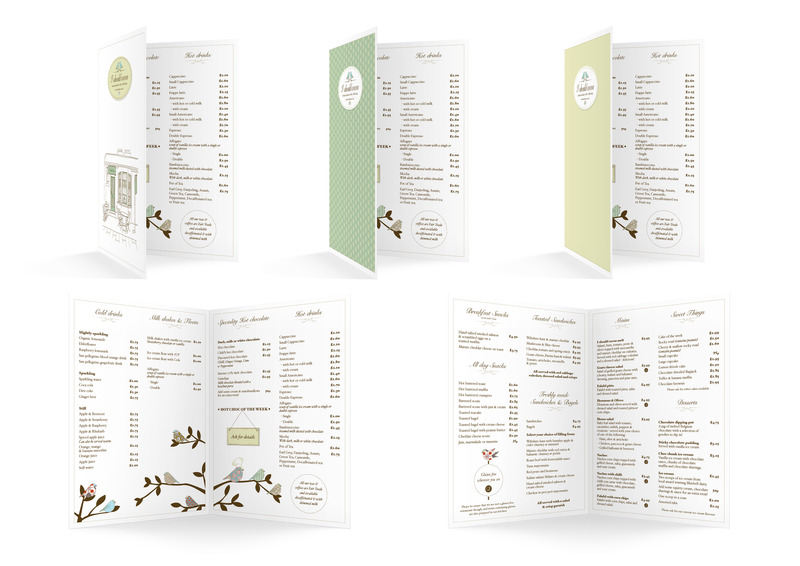 The final collection of assets include gift vouchers, loyalty cards and eat-in and take-away menus that deliver aesthetic and practical solutions for a unique business. 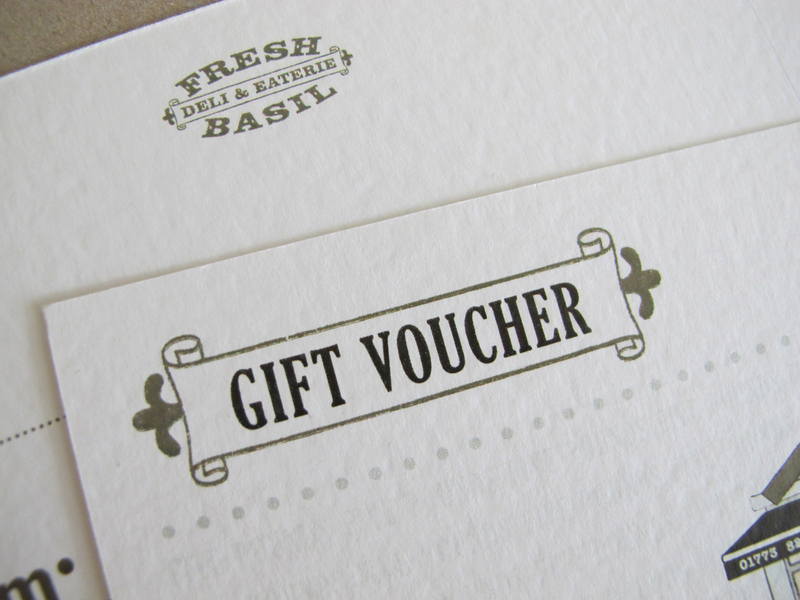 The gift vouchers are designed to evoke a sense of quality and individualism on a weighty textured stock, as well as being individually signed, dated and personalised before presentation in recycled Fleck Craft envelopes. 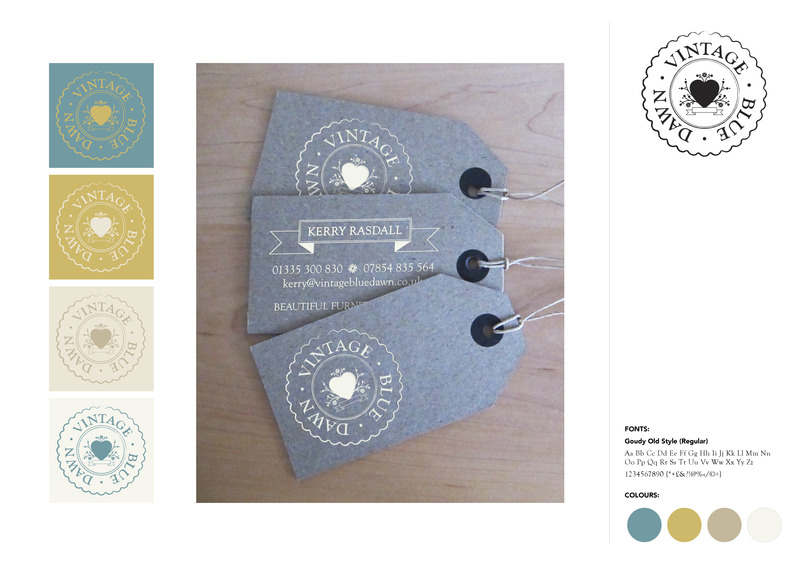 Each envelope is then completed with a final seal from a self-inking stamp. 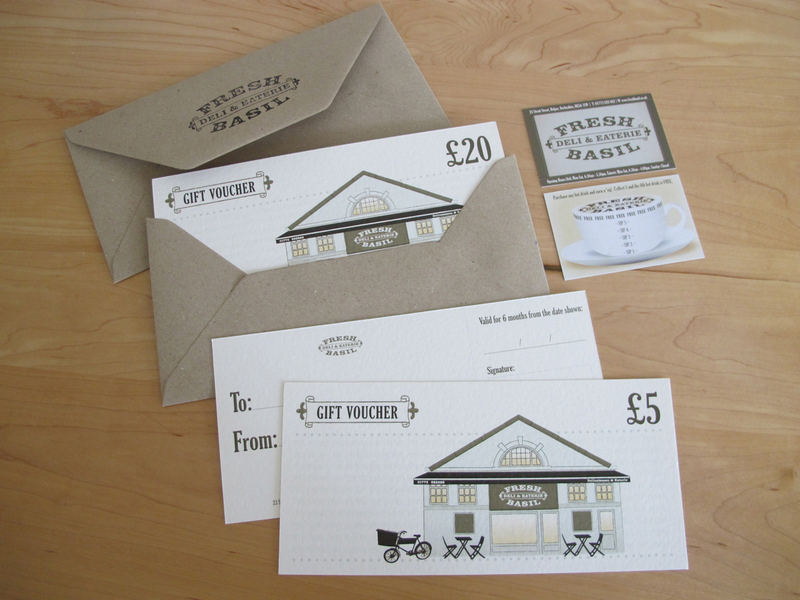 On the front of the voucher is my illustrative interpretation of the well-known exterior of the shop, not forgetting the delivery bicycle that lives outside and adds to the vintage charm. Cheekier designs that used the faces of some of the team members and referenced the styling of a £10 note were also presented, but the shop itself is the true ‘star’. The business card size loyalty cards allow for easy pocket, purse or wallet storage with a quirky visual reminder of where it’s from and what it’s for. 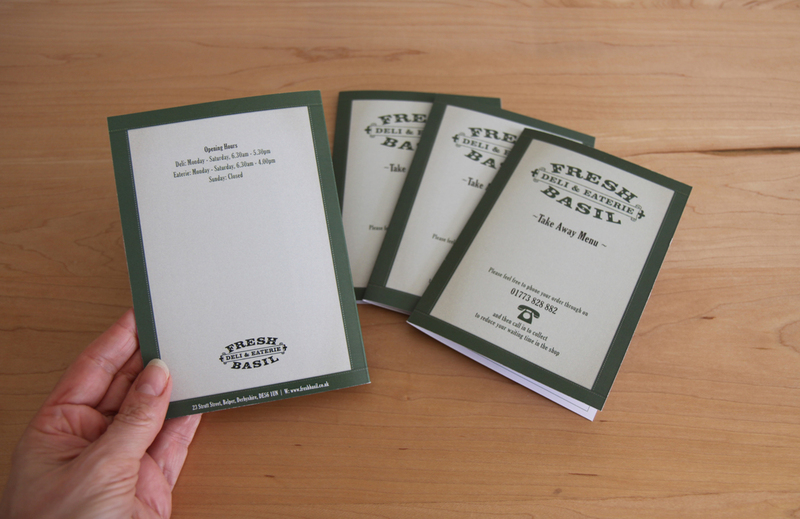 Each ‘sip’ also is stamped with a custom designed Fresh Basil ‘FB’ upon each purchase of a hot drink. The success of each item is yet to be fully evaluated, as Christmas will be the peak time for gift vouchers, but so far so good on the popularity of the loyalty cards with my client and their customers. 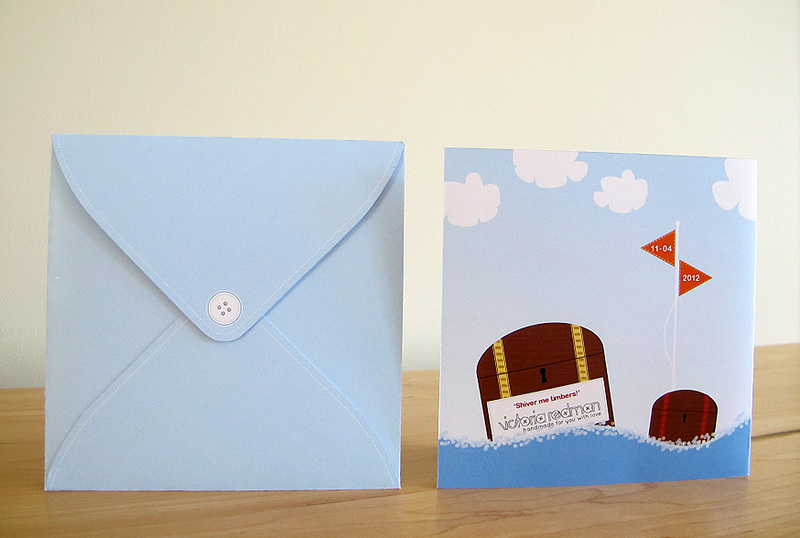 Creatin’ birthday cards for me bucko’s young sprogs be always great fun. 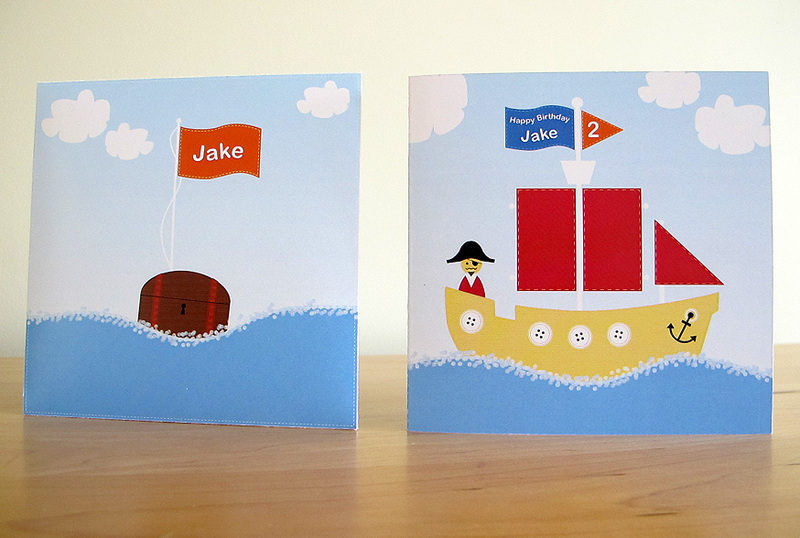 This year I thought I’d have a go at drawin’ a simple pirate ship for Jake’s second year – arrgh! Sorry, I know it’s a bit early for national talk like a pirate day, but I couldn’t resist. Vintage Blue Dawn is a new boutique-style furniture and interior accessories company, which is launching this April just in time for the Spring/Summer season of country fairs that take place throughout the UK each year. VBD won’t be creating a traditional shop, but are instead concentrating on bringing their stock directly to their customers. 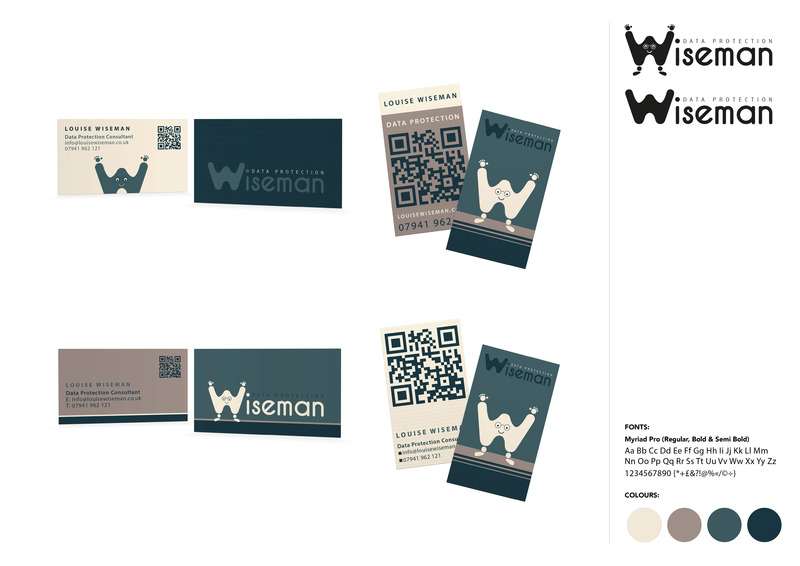 My brief was to create a visual identity that could be used on business cards and letterhead, staff uniforms and online, so I have suggested different ways that these could be printed – including a custom-made rubber stamp that would provide infinite colours and surfaces to apply the logo to. 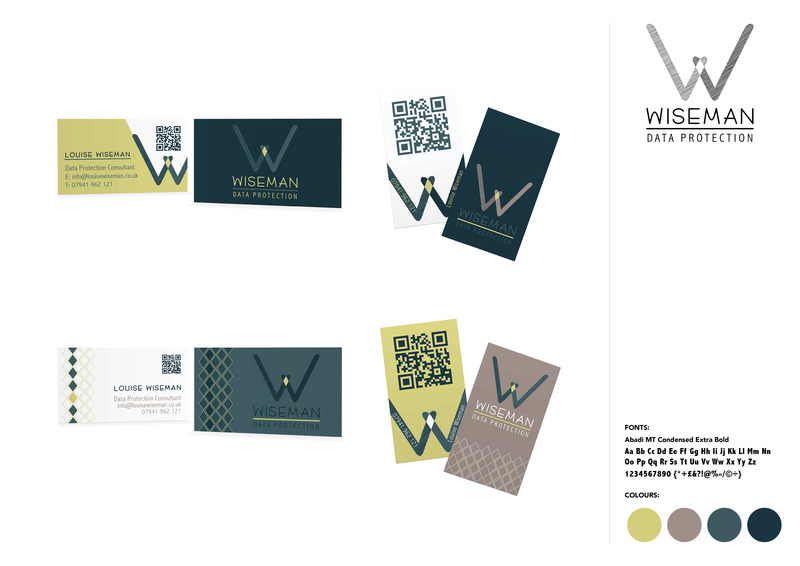 Several months ago an ex-colleague contacted me for design consultation regarding developing a logo and overall visual identity for her rapidly flourishing business. 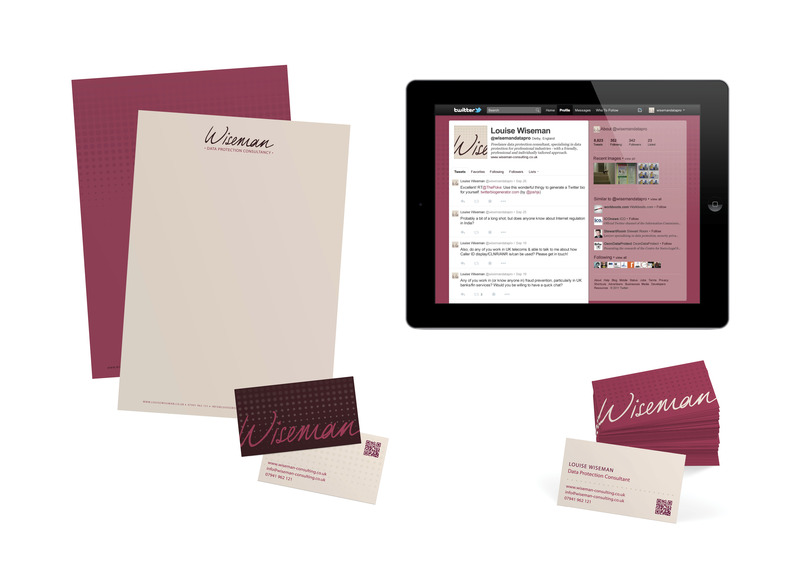 Louise Wiseman is an independent data protection consultant offering a friendly, approachable and individually tailored advice for SMEs in the East and West Midlands. 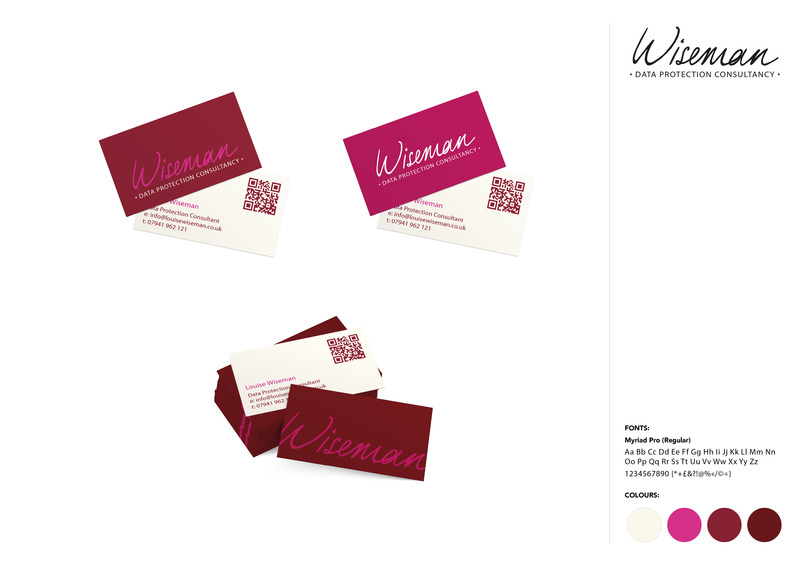 After researching Louise’s competitors (KPMG being the largest and most widely recognised), it quickly became apparent that she was offering a unique service and my initial logo ideas drew upon this; illustrating her bespoke approach. The final logo is hand drawn type designed to appear as Louise’s ‘signature’ and alluding to her individual and unique service. It also allows for easy expansion in to many other areas in future if required. As her main channel of communication is via her website and social media sites, I also incorporated a small QR code into each reverse option. 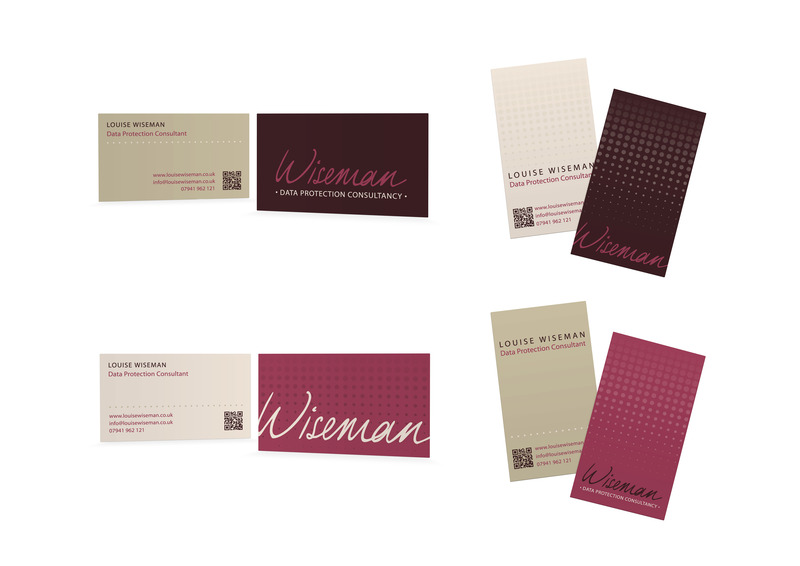 Here are the other identity options developed for Louise’s consideration. 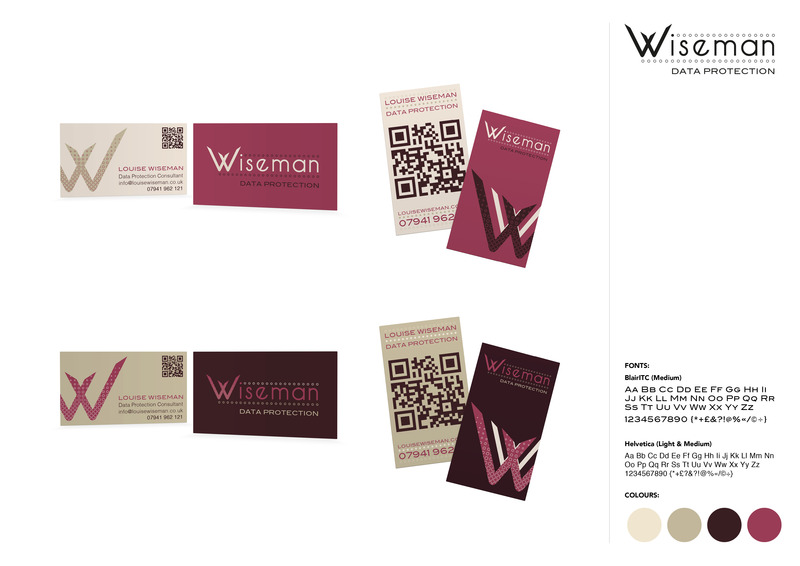 And the second phase of development, combining colours, type and imagery from a selection of all those initially presented – the clients prerogative! 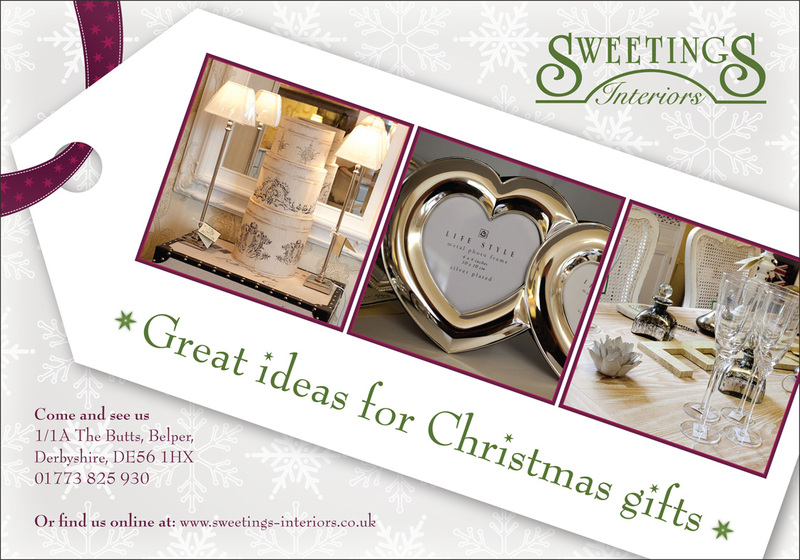 It may only be October, but retailers have to start thinking about generating trade and interest in the run up to Christmas, so a week ago I was tasked with designing a half page advert for Derbyshire Life magazine to promote the great new stock that Sweetings Interiors have in store. 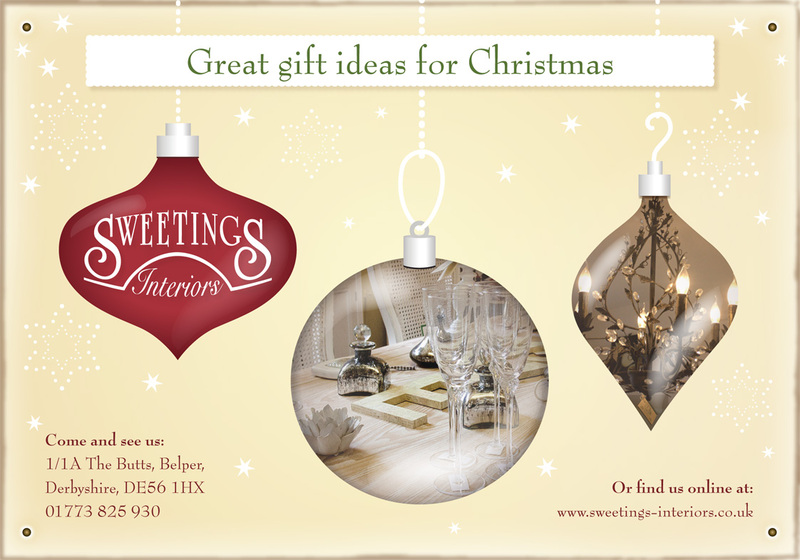 Sweetings is a grand old shop that sells a wide variety of modern and vintage inspired chic furniture and home accessories. Alongside illustrating the products available, I also hoped to evoke the same sense of vintage glamour and traditional local retailing that can be experienced at the store. 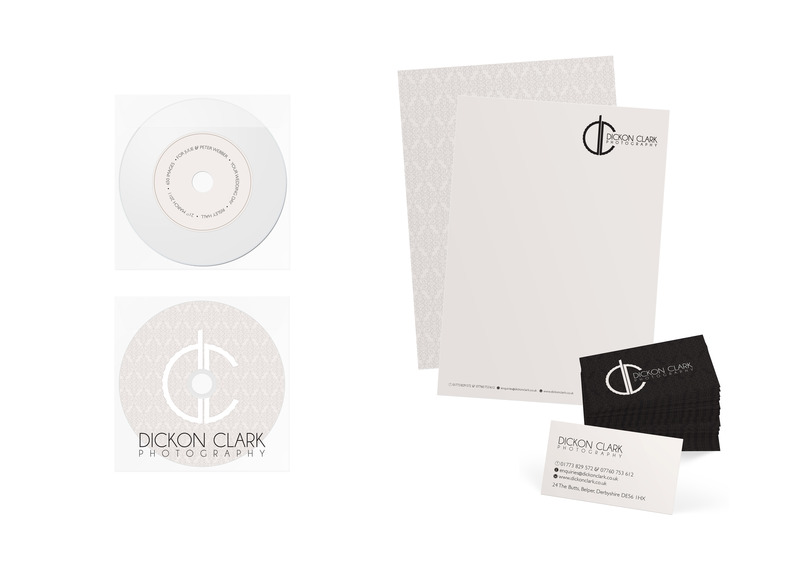 After many years in business, surviving two recessions and the increase in local competitors, Dickon Clark decided that it was about time that he had a consistent visual identity across all of his communication channels. Logos ideas are all based on the most iconic and immediately identifiable photographic tool; the camera, and combined with classic typography (plus one signature style option) – the final logo developed in to a combination of DC’s initials drawn into the shape of a DSLR camera lens – working effectively at a variety of scales and applications. Dickon already had the photographers favourite black background to his website, so I simply built upon this colour palette, introducing a soft and subtle collection of creams and golds to complement his extensive portfolio of wedding and portrait photography. A gentle damask repeat pattern was introduced to create a slightly more feminine styling appreciated by his main customer base of brides-to-be.